The Hawaii Archipelago offers diving at some of the best volcanic craters, WWII wrecks and lava tubes in the Pacific. Molokini Crater is one of the few places where you can actually dive inside a volcanic cone offering some of the best walls Hawaii has to offer. Officially, the Hawaii archipelago consists out of more than 130 islands stretching to more than 1500 miles including the Midway Islands. Waikiki, as it is often called, refers to the uncountable springs and rivers. The seven main islands Oahu, Big Island, Maui, Kahoolawe, Molokai, Lanai, Kauai and Niihau are most visited by tourists and offer unique and exiting dive sites mainly because of its isolated location and volcanic activity. The summer season is generally the best time to visit when you can dive almost anywhere around the islands. From November to May the leeward dive sites are still accessible but you should pay attention to the weather if you want to dive the rougher windier sides of the islands. One extra attraction is that you can spot whale sharks in the winter months. You don't have to search long for hotels in Waikiki as they come in all price ranges and luxe. 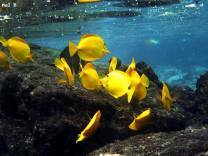 The Big Island offers excellent diving along its western windless coast near Kohala and Kona. Unfortunately many beaches have rip tides and strong undertows nowadays so be extra careful when swimming, surfing, snorkeling and diving here. Maui, the second island of the chain, offers excellent resorts such as those in Wailea, Kihei and Kaanapali. Its prime diving destination is found at the Molokini Crater; diving along the rim of an ancient, sunken volcano or underwater crater with spectacular walls and depths. Maui's small southern uninhabited island Kahoolawe used to be a target area for the US military where shells and ammunition are still found today. A bit more to the west we have Lanai which is very touristy and has excellent dive sites such as the Cathedrals and Fishrock. Molokai is together with Niihau the only islands which has been under developed compared to its neighbors. Molokai is a rough and wild island which has excellent hikes, a former leper colony and its pristine island Mokuhooniki. There is supposedly still a lot of diving to be explored off its south coast. Niihau's local population lives in solitude and has a limit on the number of tourists that are allowed to visit the island; and then only by helicopter tour or by local dive tours mostly to Lehua Rock. It is the most likely place where you can visit the endangered monk seals and schools of dolphins. Oahu is with Hanauma Bay, Waimea Bay and the WWII wrecks in front of the capital Honolulu, the most popular destination in Hawaii. It is the island most tourist fly into and many don't even bother visiting the other islands. Kauai is the last main island of Hawaii, famous for its snorkeling off Poipu Beach, the vistas of Waimea Canyon and the rugged cliffs of the Na Pali Coast. Dive Kauai's heart-starting currents full of critter surprises or visit some of the worlds less dived areas at the Northwestern Hawaiian Islands and reefs. For accommodations at this spectacular tourist destination visit Hawaii Hotels.